The Poem Farm: Old Poem, New Trailer, Giveaway! Old Poem, New Trailer, Giveaway! 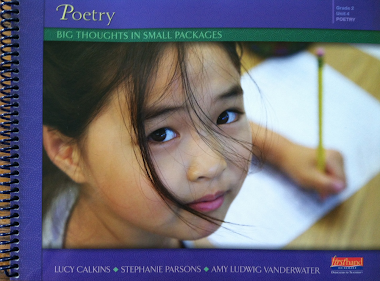 Students - Yesterday my sister wrote to tell me, "Your poem is on the back page of this month's BABYBUG magazine!" We give a subscription of BABYBUG to our little nephew, and Heidi and Luke were reading along when all of the sudden they found my old poem. This was one of my first published poems, in LADYBUG many years ago, and I was happily surprised to learn that the Cricket Media group had reprinted it. Today's poem is a short and sweet one. And really, it's simply a procedural or how-to poem. Notice how each line offers one more step in making a jack o'lantern. It's both poem and how-to. Sometimes I enjoy thinking about HOW to do something and then writing about it. You might choose to write a poem of this sort yourself. What do you know how to do? It might be something small such as carving a jack o'lantern or something big such as making a friend. One thing I do not know how to do is make book trailers. But fortunately, I know some talented people who do. I am very thankful to the team of DAS HAUS Productions for producing this trailer which captures the feeling of my poem "Forever" and all of READ! READ! 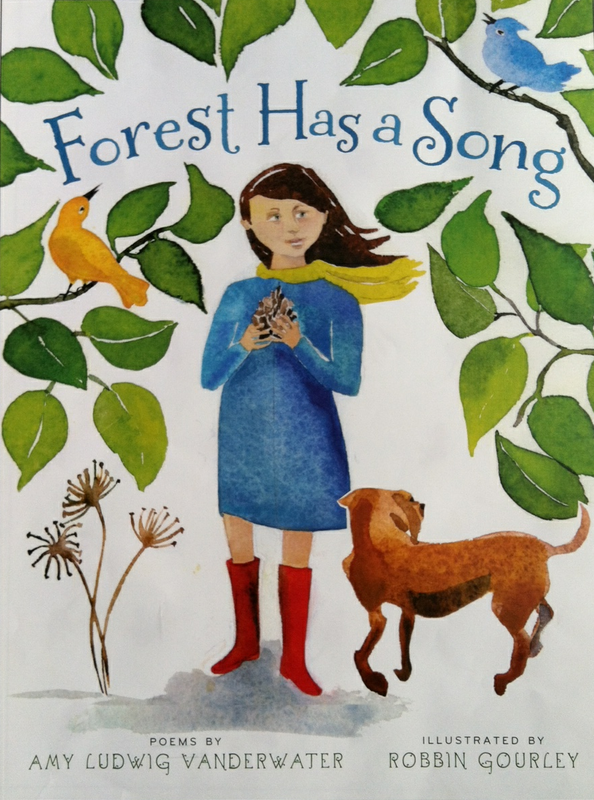 READ!, my new book with talented illustrator Ryan O'Rourke and published by Boyds Mills Press. I am holding an Amazon giveaway for 5 winners, each to win 1 copy of READ! READ! READ! This giveaway ends on October 18, and if you wish, you can enter it HERE. 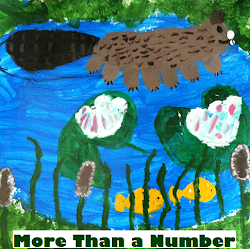 Please visit the latest post at my other blog, Sharing Our Notebooks to win a copy of Caroline Starr Rose's latest book! She's sharing a poem AND a peek inside of her notebooks. Happy Poetry Friday, friends! 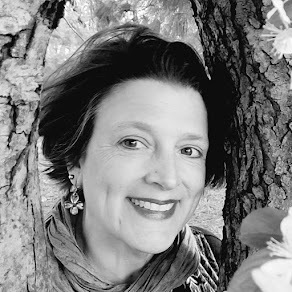 Have a wonderful time celebrating 13 this week and all week long at Live Your Poem with Irene who is hosting this week's Poetry Friday roundup! Congratulations on all your recent success, Amy! 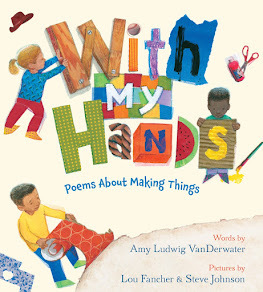 Between a poetry collection, a trade book, and a Babybug contribution - plus what's coming out in spring - I'm very happy for you! Echoing Matt. Love your Babybug poem! I love Read Read Read! So many poems touch me. I love your list poem. Brica Brac and mozzarella Cinderella! Lots of perfection. Warm congratulations as always. Amy, the video is one that should be posted all over the National Center for Families Learning site. I will tweet it out because reading is the glue to bond family reading relations. Thanks for sharing. That book trailer gave me chills! And makes me want to drive to my daughter's college campus and read just one more time with her. I am thankful for those memories we share and the books we will enjoy together in the future. Oh that video gives me warm fuzzies! What a great way to capture the importance of reading. I have so many wonderful childhood memories of reading, and I hope and pray that my students as well. I can't wait to read your new book. I have heard so many wonderful things about it. Such a touching trailer, Amy. It suits your poem beautifully! The trailer is lovely, Amy, and I love "scoop the goop", a fun surprise for you in Baby Bug again! Congratulations on your new book out this week. It looks great, will be such inspiration for educators! The trailer is beautiful and heartfelt, Amy--such a fitting accompaniment to your poem. I can't wait to dive into Read, Read, Read. Congratulations on all of your good news! Amazing trailer. It totally captures the feel of the poem. That video is so lovely, and it's true: everything you read becomes part of you. How great is that?! What a lucky thing to know so many talented people. Your poetry shines in their hands. I'm so enjoying Read! Read! Read! I think every school should have one in its library. Well done, you. Sweet jack-o-lantern poem. And, what fun for your nephew and niece to find! Love visiting this blog. I always learn and come away with a smile. 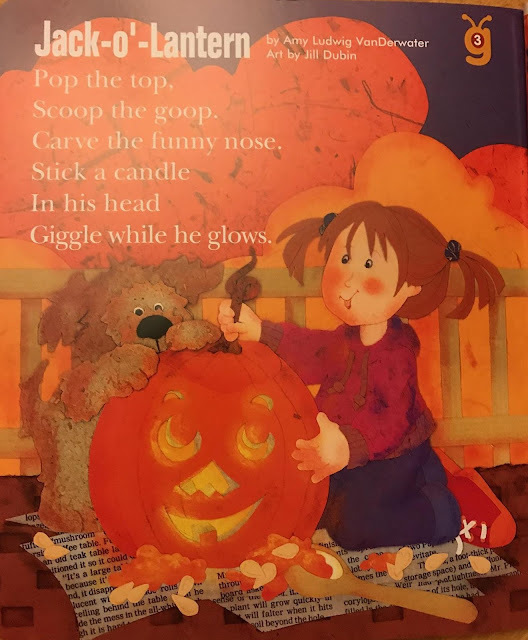 Thanks for this delightful pumpkin poem Amy, serendipity at it's best, showing up by surprise! I like the message your trailer offers, reading becoming a part of us, thanks! What a trailer! Wow. You ain't playing games, Amy LV! That could have been a commercial it was so good.